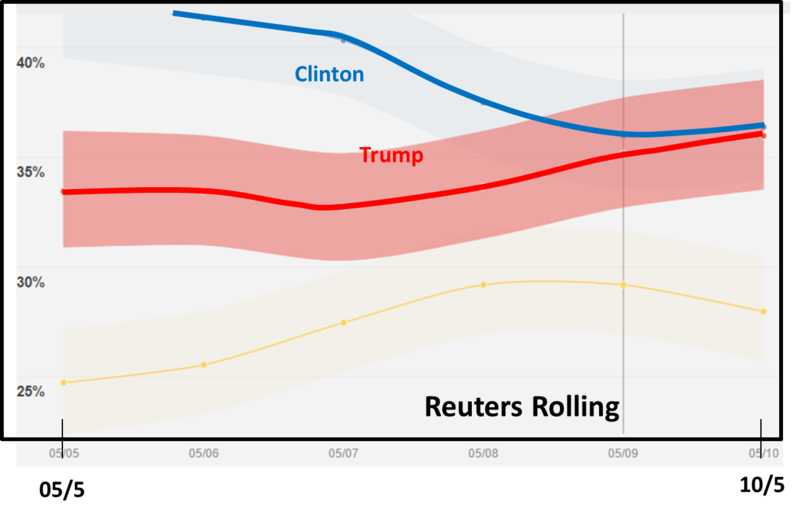 Reuters’ rolling poll on the Trump/Clinton battle now becomes something to monitor. It is still early days, but the Reuters’ poll suggests that things are much closer than the headlines in the US media over the last few days. I begin to think that many of the stories in the liberal/left media are more wishful thinking rather than any real understanding. In fact, nobody still quite understands why Trump is riding as high as he is. Trump seems to be within 1 percentage point of Clinton rather than the tens of percentage points difference that some were quoting just a week ago. I see no reason to change my opinion that this is an anti-establishment wave where the content of what Trump has to say is less important than how “anti-establishment” he is perceived to be. And that perception is directly related to how many establishment figures (including the media) are attacking him. Headlines against Trump in the Washington Post or Huffington Post or NYT are just as effective as attack speeches by GOP establishment figures in solidifying his support. Chaos within the GOP is not necessarily a bad thing for Trump. In fact, visible opposition from establishment Republicans is probably a good thing for him. The GOP needs a Trump to rally around to keep the Party relevant, much more than Trump needs establishment GOP support to woo the electors. For the Democrats Sanders is riding the same anti-establishment wave, and not a left-leaning socialist wave that some assume. There is very little chance for him to displace Hillary Clinton, but she has also misread the mood. She has been moving to the left to try and steal Sanders’ thunder but traditional “left” and “right” are not drivers. Just moving to the left in policy terms will not serve her and will not remove the stigma of being “establishment” to her bones. The rejection of “establishment” is showing signs of being a global phenomenon. Anti-establishment views are helping candidates from both the left and the right all across the globe (Greece for the left, Philippines for the right …). It is the perception of offering a “new way” which challenges old, “politically correct” platitudes, which is, I think, the dominating driver. 2016 could be the Year of the Mavericks. This entry was posted on May 11, 2016 at 8:59 am and is filed under Behaviour, Politics, US. You can follow any responses to this entry through the RSS 2.0 feed. Both comments and pings are currently closed. I really like your analysis about Trump. You are probably ahead of all bloggers by a few weeks or a month. Your hypothesis on anti-establishement seems plausible.